Well.. I lied. I completely intended to blog more in the last few weeks (as evidenced by my last post!) but I’ve just been too busy. I had my 21st Birthday to plan, uni assessments galore, the Psychology ball to organise, and now Laura’s 18th is coming up in a couple of weeks. Yikes, I get exhausted just thinking about it all! 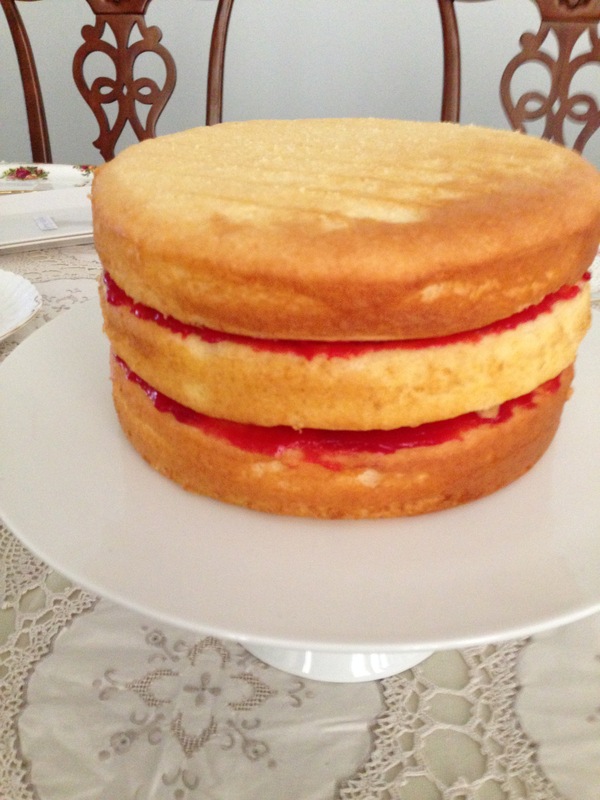 However, while I haven’t been blogging, I have been baking. 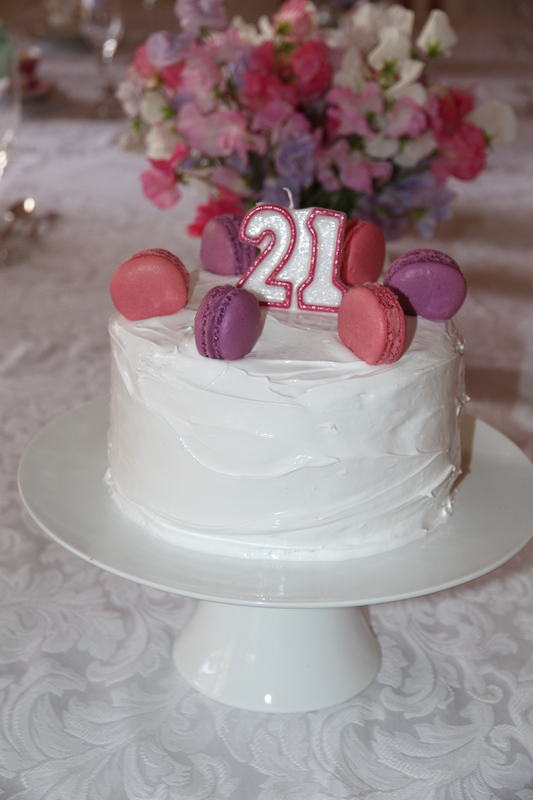 Here is the cake I made for my 21st Birthday afternoon tea – triple layer vanilla cake with a tangy raspberry filling & super glossy meringue frosting, topped with vanilla bean macarons. 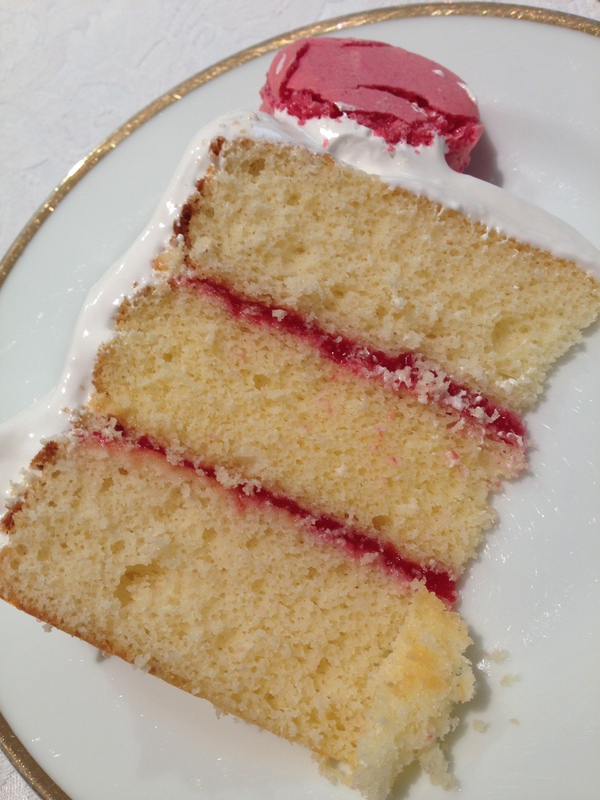 The raspberry filling was perfect as, otherwise, this cake was going to be too sweet, so I would certainly recommend leaving it (or perhaps substituting it for a tangy lemon curd if you’re not a raspberry fan) to cut the sweetness from the frosting. Don’t worry, the empty plates in the background didn’t stay empty! The raspberry filling needs to be made at least a day ahead but keeps well in the fridge so can be made up to a week ahead. 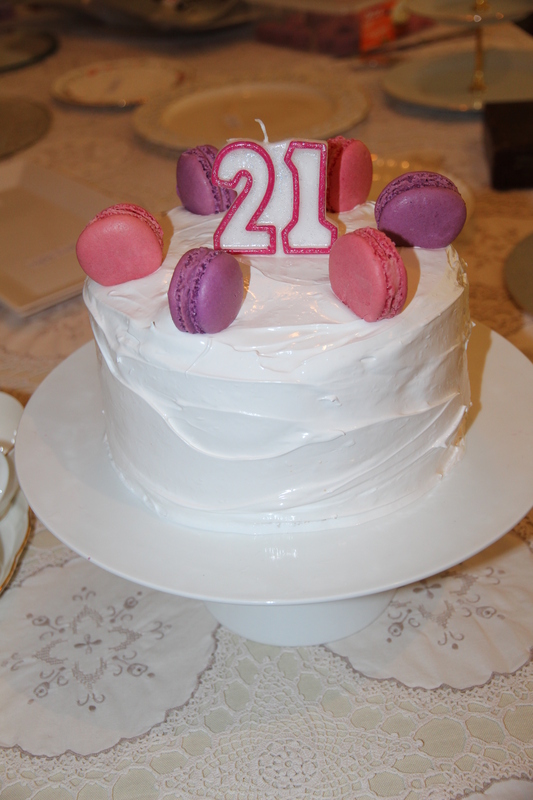 I also made the macaron shells a couple of days ahead to save me some stress on the actual party day. The frosting should be made the day of serving as it does not keep particularly well. In a saucepan combine the raspberries, water, sugar, and lemon juice. Bring to boil and simmer for 15-20mins or until the raspberries have broken down. Remove the mixture from the heat and strain with a fine mesh sieve. Return the stained mixture to the heat. Dissolve the cornstarch in water. Whisk the cornstarch mix into the raspberry mixture. Bring the mixture back to a boil and simmer for 5 more minutes, stirring occasionally. Remove from heat and cool completely. To make the cakes: Line & grease 3 20cm cake pans. Set oven to temperature specified by the cake mix boxes. Make cakes according to box instructions, add ½ teaspoon of vanilla extract to each cake mix & divide mixture among the three pans. Bake for specified time, or until a skewer inserted comes out clean. To assemble the cake: Carefully place a cake layer on your serving platter. 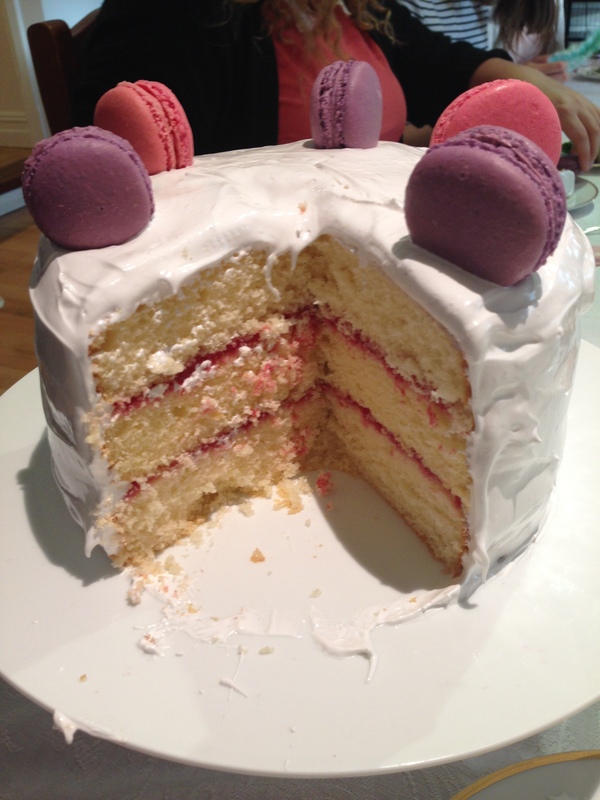 Top with a generous amount of raspberry filling and spread gently using a spatula to make an even layer. Top with another cake layer and repeat. Finally, top with the final cake, ready to be frosted. To make the meringue frosting: Add egg whites, sugar, liquid glucose and cream of tartar, and simmer over a pot of water (not boiling), whisking constantly but gently, until temperature reaches 54°C on a thermometer (be patient, it does get there eventually!). Beat heated mixture with electric beaters on a low speed for 2 minutes, then increase the speed to medium and beat for 2 more minutes. Increase the speed to high and beat until it is very thick and glossy, about 5 minutes. Frost cake immediately by piling the frosting on top of the cake and, using a metal spatula, gently spreading from the top down. Smoothe as much as possible with your spatula. Top with 6 macarons, 3 of each colour and a candle (if desired). Serve each piece with a macaron & enjoy!